Records all calls automatically - up to a maximum of 10 hours! Log all appointments and business discussions ensuring accuracy and proper follow-up. Automatically maintains a database that allows access to important calls by caller ID, date and time or by a unique index text identifier of your choosing. Please note that this product is a special order product and is not returnable. In business life there may be various reasons for recording your calls. Vidicode supplies a range of professional Call Recorders for desktop use to meet every need. An important application of Call Recorders is to guarantee that there can be no doubt about verbal agreements. In the financial world it is usually obligatory to record telephone conversations. In many other professions, it is just as essential to register agreements that are made on the telephone. Whatever the application, call recording will save you a lot of time and costly disputes. Thousands of Vidicode recorders are used to provide security for people and objects. The essence of a threat is likely to be lost if it is not recorded. A Call Recorder is therefore essential for large companies, publicly accessible institutions (hospitals, theaters, etc.) and people with a security risk. Some professions have to be accountable for their actions. Therefore Call Recorders play an essential role in health care and work in the public sector. Professionals in these fields have to be able to justify or evaluate actions and to prepare staff better for a situation in the future. Future challenges may include a sales conversation or the need to respond to a crisis. 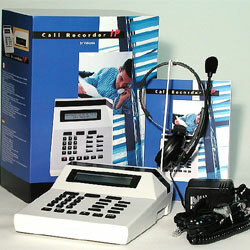 The Call Recorder Single product range has been designed for the personal desktop. The recorder is therefore specifically intended for someone who frequently wants to listen to their own calls. This is in contrast to the Call Recorders that record at a central point and which are intended to archive many people’s calls as a silent background operation. With a Call Recorder Single on your desk you just need to press a button to listen to your conversation. The Call Recorder Flash has enough memory for either 5 or 10 hours recording time. This model is used when it is only occasionally necessary to keep recordings for a long time. All calls are automatically recorded. One press of a button is all that is required to archive a recording permanently. Other recordings are overwritten after 5 to 10 hours of talk time. The typical application is to ensure that threatening calls are recorded. The Call Recorder HD 9900 is the most popular model. This recorder saves up to 9,900 hours' talk time divided into up to 500,000 recordings. Anyone who has had experience of searching through files on a PC will be amazed at how fast the recorder can locate a recording in this gigantic archive. The main advantage of this type of recorder is that you never need to worry whether or not a recording needs to be made. The enormous capacity is sufficient for a number of years. The Call Recorder HD9900 can also be supplied with an internal CD recorder. With a hard disk, network and CD, this recorder can be used for almost any application. The Call Recorder Single offers the same options as those featuring on central systems. One example is high capacity, with the ability to record up to 9,900 hours on a hard disk or 250 to 300 hours on a CD. Furthermore, all Call Recorders Single come with a network connection so that recordings can be channeled straight through to a PC or server. All the known details of a recording such as the telephone number, date and time are registered. It is possible to search through the thousands or tens of thousands of recordings in the memory very quickly, using the buttons on the recorder. The same can be done using a PC with a network connection to the recorder. The Call Recorder Single has various standard methods of protection against being used improperly, such as password protection. Users’ privacy can be protected by automatically deleting recordings according to a strict schedule. A spoken message or a beep can be used to warn those involved, where necessary, that a recording is being made. The optional CryptoCard makes it possible to offer an even higher level of security. Distribution of recordings via public networks is completely secure when the recordings are encrypted using the CryptoCard. Use of a CryptoCard gives those involved full control over who can listen. Where unconditional privacy protection is absolutely necessary, the CryptoCard delivers results. The optional Call Recorder Access software makes it possible to access the content of multiple recorders via the network. The same software can be used for different models of Call Recorder for the desktop or for centralized recording. The software displays the collective content of the connected recorders as a database. Every recording can instantly be downloaded from the recorder and played on the PC or be exported to another medium. Recordings of fax traffic can be used to display or print the document. There is another software package available for call monitoring. You can listen into the recorder in real time via the net for training purposes for example.